Working in a fast-paced kitchen may be one of the most high-pressure jobs out there. There is an art to executing a dinner rush, working to deliver well-cooked dishes under the tight time constraints. When you get into the groove and are firing plates out one after another and hitting your order times it’s also one of the most satisfying jobs that you can work. Perfectly executing a dinner service under all of the pressures is a great feeling, and it’s one that Overcooked! 2 does a wonderful job of recreating. The mark of a truly good simulation game is its ability to tread that line between replication and entertainment, and that’s where Overcooked! 2 shines in its hilariously chaotic fashion. Featuring a delightfully charming soundtrack, the charming exterior hides a complex and strategic game requiring time management and careful planning, and is an absolute blast to play whether alone or with friends. Shortly after your introduction to the game you find out that the kingdom has become overrun by the Unbread because the king decided to read from the Necro-nomnom-icon, and raised them from their yeasty graves. Now it’s up to you, and any friends who want to join in either locally or online, to learn the ways of cooking so that you can sate the hunger of the Unbread with delicious cooking. It’s a cute storyline, but it’s one that impacts the game more aesthetically than it does narratively. The story just serves as a vessel to deliver the main course. 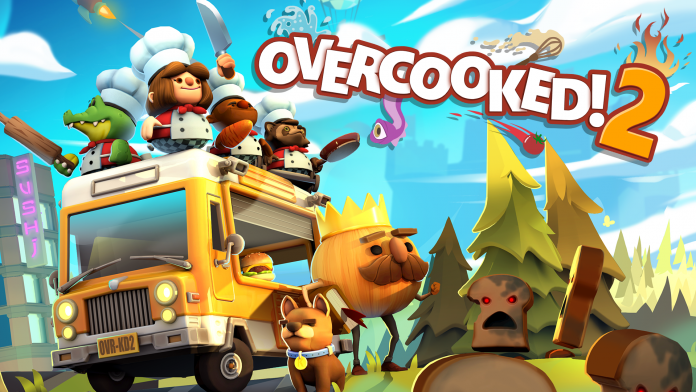 For those new to the series and the chaos of the kitchen, Overcooked! 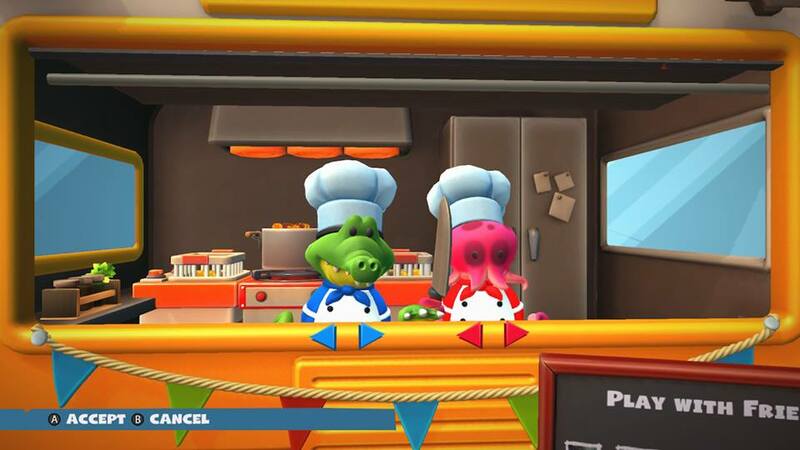 requires players to work together — or alone if they dare — to complete recipes in a variety of challenging kitchens. I say challenging, because every kitchen has one of more obstacles that players must overcome in order to successfully complete their service. This can be something as simple as being separated from your utensils or stove by a moving barrier, to multiple floating platforms and hot air balloons falling from the sky. I’m not sure who the architect was for these kitchens, but I’d like to have a word with them about the lack of guard rails along the ledges. You pick your raw ingredients up from crates, or occasionally from conveyor belts and other fun delivery services, and then you have to cut and often cook your ingredients using the require methods. You can throw raw ingredients, which allows you to occasionally circumvent some of the obstacles, or throw them right into frying pans or deep fryers if you have good enough aim. This can save valuable time and it’s a really useful skill for later levels to be able to throw raw ingredients exactly where they need to go. It can sometimes be hard to properly select the right item, and in the chaos it’s easy to press the wrong button or put an item down in the wrong place. It serves as a constant reminder to keep a cool head in the kitchen. 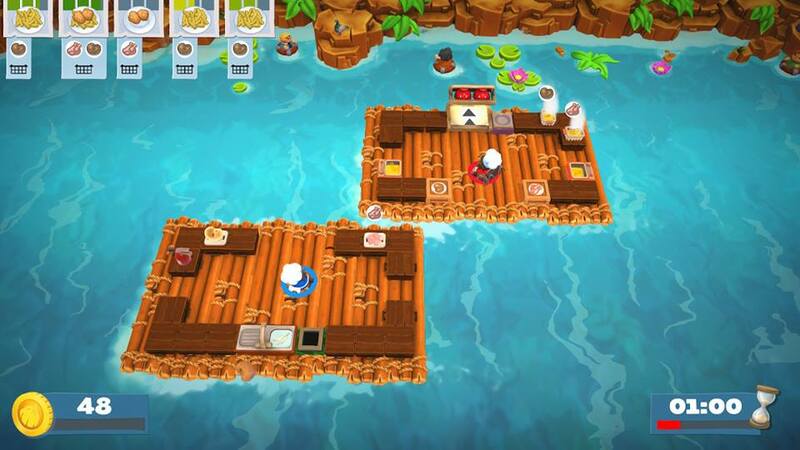 If you’re playing solo then you can switch between two chefs with the bumpers, but playing cooperatively requires you to coordinate verbally with your partner, or partners, in order to properly execute a dinner service The quicker you serve your food, the more money you’ll make from your guests on tips, in addition to the base amount you get from serving each meal. Serving multiple meals in quick succession generates additional tips and allows you to really rack up some serious cash. There were a few instances where I actually made a lot more in tips than I did in actual meals, which is key to maximizing your score. Service is graded on how many dishes you serve and ultimately how much money you make, with funds subtracted from your total for every meal that you missed. Your recipe card in the top left will start vibrating and a sound will signal an impending failed order, and once you’ve missed your opportunity to serve the meal you have to move on. Chances are that the customer left because you were too busy putting the fire out in the rice you forgot you were boiling. Kitchen fires can completely ruin a good run, so it’s important to stay attentive to anything that’s cooking. You can earn up to three stars per level based on your total score, with the ability to unlock additional chefs when you reach certain milestones, and bonus stages for Kevin the dog to give you a few extra stars. These special missions are a little bit trickier than the regular levels, but they are definitely worth completing. Advancing to each level requires you to have a certain numbers of stars, which initially isn’t a problem because the first kitchens are relatively simple; at least in comparison to what comes in later levels. The difficulty starts to scale up once you start taking the fight to the Unbread, and there were a couple of instances I had to hop back to an earlier level that I had initially been content with a single star on, to use my new skills to three-star an earlier level. I spent a fair amount of time playing Overcooked! 2 with my wife Ashleigh, because the game truly is a much richer experience with friends. The multiplayer requires constant communication, and a firm understanding of the role that you need to fulfill at any given moment. You need to know when to pass ingredients to your partner, wash dishes so that you can plate your food, and of course manage to serve your dishes within the allotted time without setting the entire kitchen ablaze. Even when Overcooked! 2 got challenging and we failed a level, it was never frustrating. There is something about the methodical puzzle simulation that makes you just want to perfect your technique and nail the next round of service, much like it felt working in an actual kitchen. There is no better feeling when playing cooperatively than nailing a dinner service. When your coordination is on point and everyone knows the role that they need to play, you almost don’t need to speak. Overcooked! kitchens are set up in a way that so long as each player understands how to effectively run their station, you can execute a flawless service. 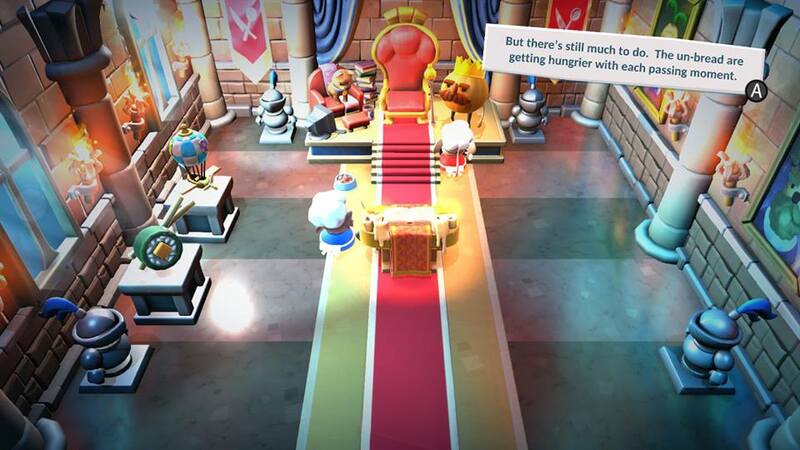 With its colourful aesthetic and charming presentation, Overcooked! 2 entertains and delights at every turn. 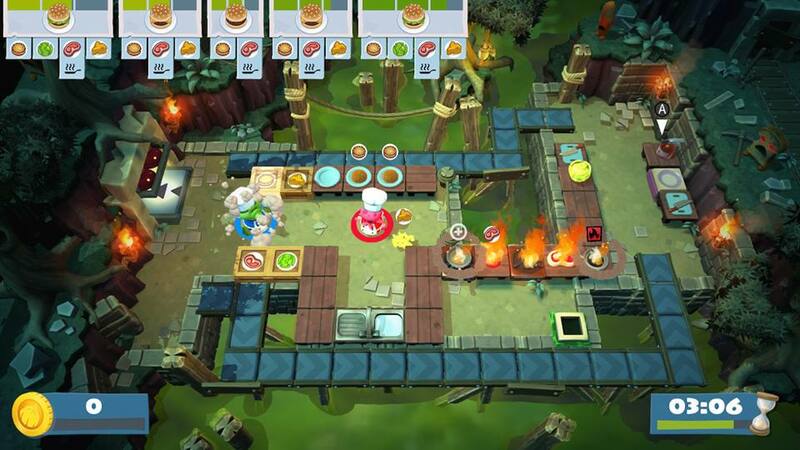 The problem solving required to succeed whether you’re playing alone or with friends creates a truly unique type of gameplay that is completely reminiscent of working in an actual kitchen. Time management and coordination are key, and beneath its adorable garnish lies a gem of a cooking simulator. The ability to take the game everywhere with me on the Nintendo Switch is just an added bonus, and I look forward to being able to test out the four-player kitchens with my friends in the coming weeks. Overcooked! 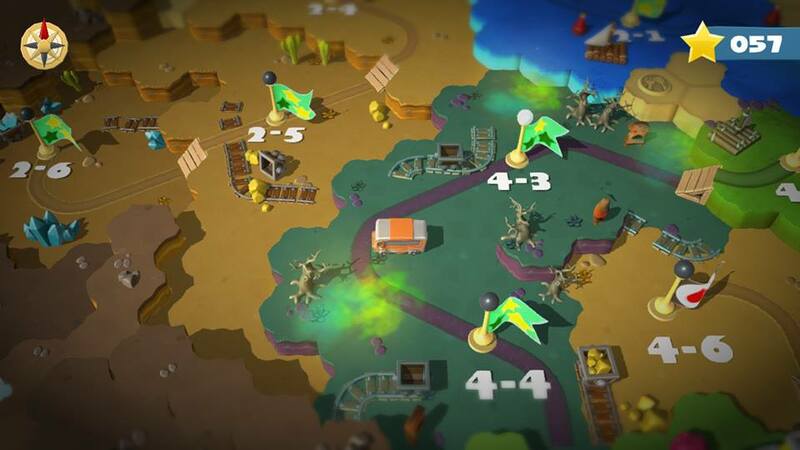 2’s deceptively simple formula challenges and entertains at every turn, and with friends it serves up a perfect dish.